This may be news to scientists, but I bet it isn't to mothers: Babies are extremely rewarding. (Irritating too, no doubt, but that's another story.) During a certain stage of development, they do the "gaze game", looking at the parent (or passing stranger) and smiling and making small sounds. If they get eye contacts, the levels of pleasure chemicals shoot up in the baby's brain. And, it turns out, in the parent's. Yes, that's right: Babies make you high. I've long suspected that there are some baby junkies out there. I look at them cooing, absolutely riveted by the little bundle. Oh, and it can happen to men too. You let the little suckers get eye contact, you've lost. Now in all honesty, I have never had a baby, and I've never been in love. (You'd think that one follows from another, but it isn't quite that easy. See below.) Anyway, I have watched friends and occasionally relatives in those situations, and I definitely have a theory. I think people who are in love with one another tend to play the baby gaze game. I've seen them look into each others eyes and get that silly expression. Yes, they have a baby high. There is no doubt in my soul about it. Even here in Norway where people don't call each other "baby" when they are in love. Mind you, that's cool by me. You can hardly have cheaper entertainment than looking into one another's eyes and feel good. I trust that most people are able to do this without their instincts getting the better off them so they actually believe they are babies. There may be another connection, though. I've pondered that. Perhaps the awakening of the baby joy reflex primes people to want babies. The real thing. And so motivates them to actually go forth and multiply, as it were. There certainly seems to be a connection in time between the "oh baby!" type of love and the "oh, a baby!" type of surprise. Furthermore, I have thought (don't I always?) and my thought was that perhaps the baby gaze game is an instinct not just in babies, but in lovers too. Of course, people being humans, they can override their instincts or modify them if need be. But at least a hereditary inclination. Heh. 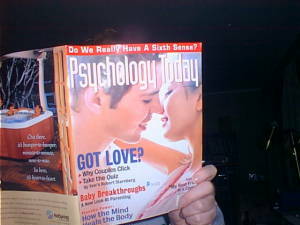 And here's what I think: I think that perhaps it serves a useful function, by verifying that the partner has baby eyes. Let me explain. Human babies are extremely helpless. For this reason, it makes sense for both parents to hang around and take care of the little bundle. Oh sure, you can do it alone, but it's not an ideal situation. Now in extremely popularized sociobiology, the male is supposed to hang around the cave because he never knows when the female may be in heat, and so he accidentally also chases away cave bears and neanderthals, and brings home some dead animals to impress the female. The baby is coincidental in this scenario. I don't think so. I'm not sure if I actually have the baby gaze myself. It seems to me that babies look at me strangely when people put them in my arms, or start to scream. Something similar applies to women. But I guess it is sort of a moot point anyway, by now. In other news, I've been pretty shabby today. Spent much of the workday in some state between sleeping and awake, barely conscious. It did improve a little after closing hours. But my sinuses are hurting a bit and my eyes are sore, and even my digestion is growling and acting up. Not sure what I've done to offend it, either. I guess the very limited rain may have brought down to earth a lot of pollen, which could explain the sinuses and eyes. The air did certainly smell pretty strongly as I walked home today. I guess I should finish this and try to calm myself. I tend to get a bit nervous when my body is no longer working perfectly all day and night. You may say that I have been spoiled. Well, I'd love to be spoiled some more. Just a little rain today.